At Fitness Ring our aim is to provide affordable, cost effective and alternative fitness choices that will see you achieve overall personal fitness goals. We are 100% committed to helping you achieve your health and fitness goals. Our mission is to inspire you to lead a healthy lifestyle. Get ready to have fun while you get fit! horn, Camberwell, South Yarra, Toorak, Prahran, Collingwood, and Armadale. There's a tram stop right in front our our building. 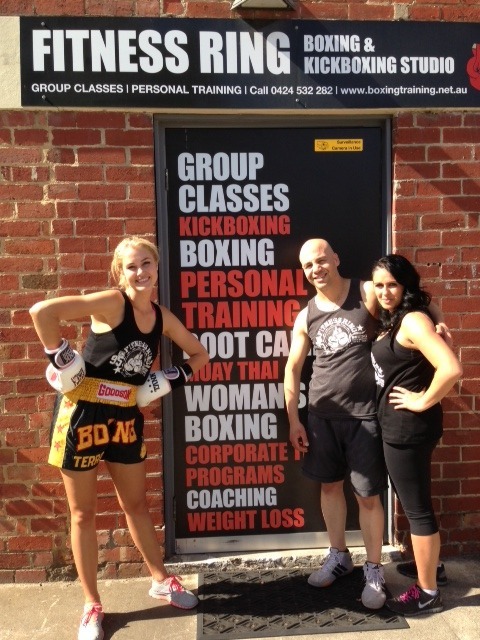 Hear are some of the pictures and video taken during Coxy's Big Break where Fitness Ring entertained and trained ex Miss Australia a s part off Coxy's story on Woman's fitness and why they enjoy boxing as great environment to keep fit and learn some self defense at the same time.